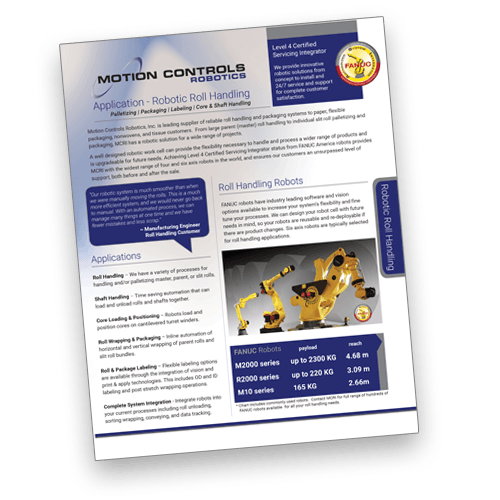 Motion Controls Robotics has extensive experience palletizing rolls of different sizes and shapes. Rolls can be removed from slitting operations or upstream packaging operations and palletized with the eye in a vertical or horizontal orientation. A pair of FANUC R2000 robots works together to remove slit rolls from a winder/slitter operation and palletize slit rolls of roofing material. Full and partial pallets can be formed within the robot cell. One robot moves a pallet from the empty pallet delivery conveyor and places it on the palletizing conveyor. The same robot places an empty tier sheet on the waiting empty pallet and then moves to the slit roll mandrel staging area. This robot slides the waiting slit rolls one at a time onto the end of arm mandrel (inflatable ID gripper) tool of the second R2000 robot. 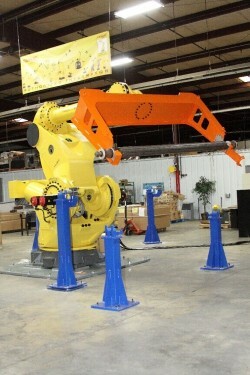 The second R2000 robot rotates the roll from eye-horizontal to eye-vertical, and places it on the pallet at the palletizing position. can be stretch or heat shrink wrapped prior to being placed on the pallet at the palletizing position. 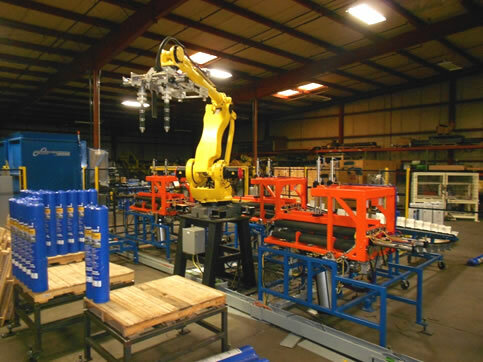 This teamwork between the two robots continues until the mandrel of staged slit rolls is empty, at which point the mandrel moves to a replenishment position from the roll winding/slitting machine, and the process is repeated until the pallet order is completed. This order filling process Is repeated until all pallets are completed for a specific roll winding/slitting setup. The robot cell may be installed immediately adjacent to a slitting operation. MCRI builds equipment to strip the slit rolls from the slitting mandrel, pick the roll by its inner diameter (ID), then palletize it. The product can be stretch or heat shrink wrapped prior to the palletizing operation. The above operations are performed without human intervention. In instances where the process requires human intervention, such as quality inspection or hand packaging, the robot cell’s safety system can be designed to easily incorporate operator entry/exit of the cell or give operator easy access to the product in one area of the cell while another area(s) of the cell continues to operate. Various applications and robots used for roll handling applications. In this MCRI supplied continuous roll processing and packaging system, jumbo rolls of specialty product are first slit and wound onto a mandrel. A FANUC M2000 robot, the highest capacity six axis robot in the world, picks up the mandrel and places it onto a roll separating station. 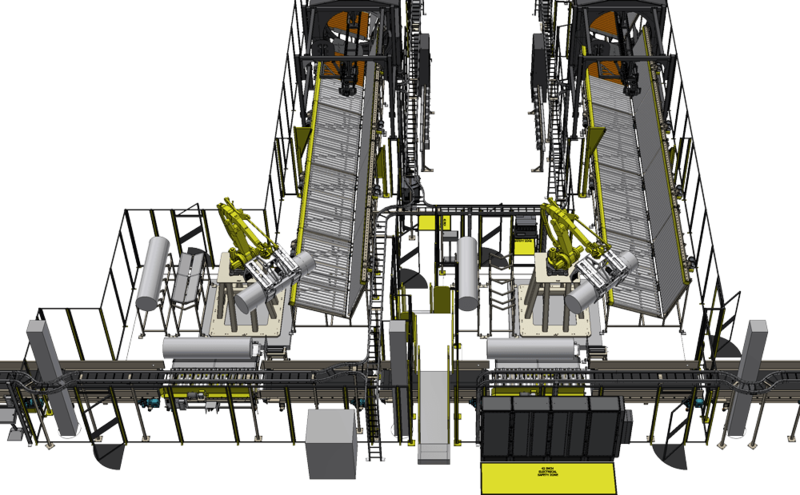 The M2000, assisted with other automation, moves slit rolls to a robotic pick station. A FANUC six axis R2000 robot uses an expandable ID gripper to pick up individual slit rolls. The R2000 is mounted to a Gudel rail which allows it to travel to multiple palletizing positions. In addition to rotating rolls so they can be palletized with vertical core orientation, the R2000 also picks up empty pallets from a pallet rack and places the empty pallet into each of the palletizing positions. The R2000 has one more trick up its sleeve – it also handles divider sheets that the R2000 places between rolls to keep them from sticking together. In one packaging/palletizing cell, a combination roll shaper/up-ender was designed and built by Motion Controls Robotics to reshape the product; during transit from the roll production machine to the packaging/palletizing area, it could become slightly deformed or out of round. The roll shaper spins the roll from a slightly flattened shape back into a round shape. The shaper is tilted 90 degrees to stand up the rolls, and the robot uses a pair of inflatable mandrels on its end of arm tooling to pick a pair of rolls from the up-ender. A simple vision process at the up-ender allows for the labels on the rolls to be oriented the same way on the pallet, which may be important for point of sale display. Motion Controls Robotics roll handling cells can strip slit rolls from mandrels, sort and palletize them, and perform a wide variety of other repetitive packaging operations. The product is typically fed into the system via conveyor or presented to the robot on a mandrel. A spinning operation can take material that has sagged and made it concentric again. The robot and related conveyance equipment have the necessary precision to consistently palletize long, narrow rolls of rolled roofing product without tipping over rolls. 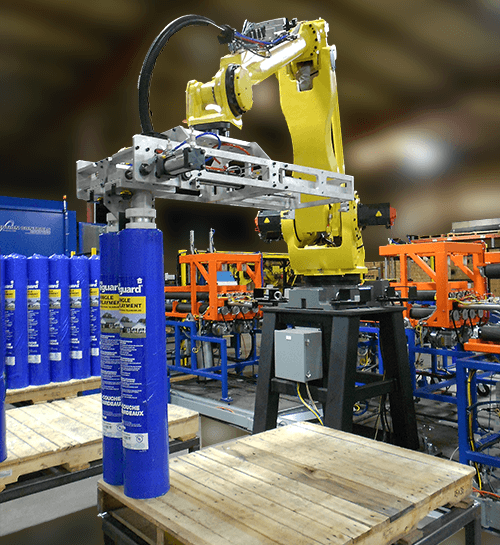 In the robotic packaging and palletizing cell supplied by Motion Controls Robotics individual rolls of insulating fiberglass are moved by a FANUC M410 robot to two separate wrapping lines. The rolls are conveyed on a tilted conveyor to keep them grouped, then run through a wring wrapper where they are formed into a bundle of rolls before being up-ended for shipment. Clamp trucks pick up a unitized bundle of insulation (no pallet is used) and set it on the floor of the shipping truck for maximum truck volume utilization.